My blog goal is to share at least one crafty project a week, so I am calling it "Project of the Week" or POTW for short. My first project is a mini album from Alex's first birthday. Yes, that was over a year ago! 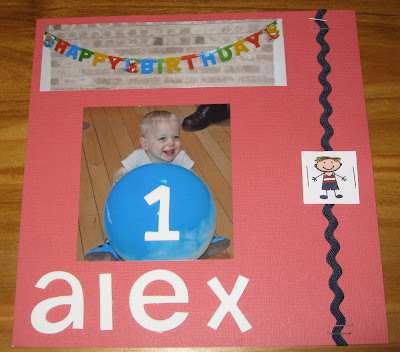 I started the book using Stacy Julian's Finish Line Scrapbooking method but then set it aside. I kept it a simple scrapbook and am glad that I finally finished it. I made it from a kit that I bought at Marshall's for about $5-10. I think that the manufacturer was We R Memory Keepers, but I am not sure anymore. I also used some DCWV 8x8 card stock and American Crafts Thickers. I am sharing my favorite pages from the album. Updated: It was the We R Memory Keepers Frenzy kit, which was still in stock at my local Michaels on 5/8/11. I got a great deal on the kit! Looks like a cute mini book!